The Shaggy Mane is very easy to identify. 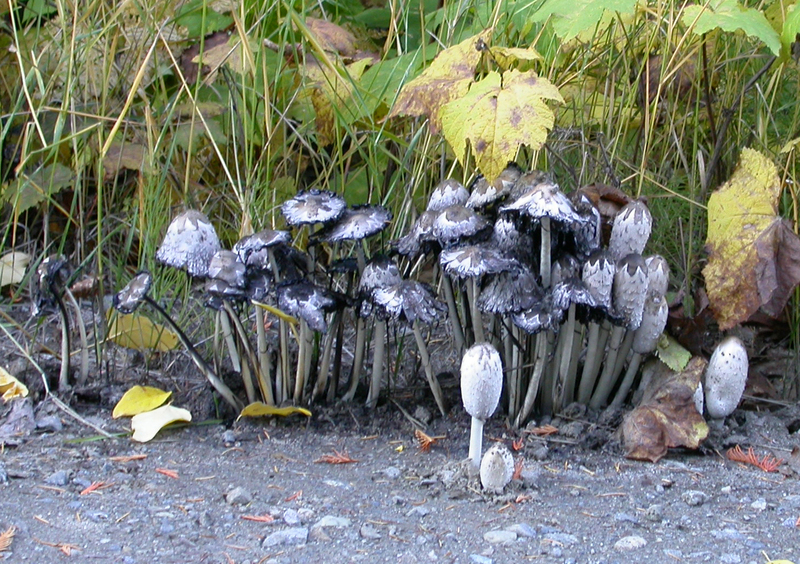 A flush of Shaggy Manes can have mushrooms at various stages of maturity. Description: Fruiting body is tall and white with an almost cylindrical, bell-shaped cap that has “scales” which give a “shaggy” appearance. The cap has gills that are very tightly packed together, and they will quickly “melt” away into a dark black, inky liquid within a few hours of being picked. The flesh is tender and delicate. I have only ever eaten this mushroom raw. I came across a patch of Shaggy Manes at the edge of the woods while I was visiting a wildlife park in Germany. This is one of only a few mushrooms that are almost impossible to mistake, so I quickly sampled a young one… delicious! Young to very mature Shaggy Mane. 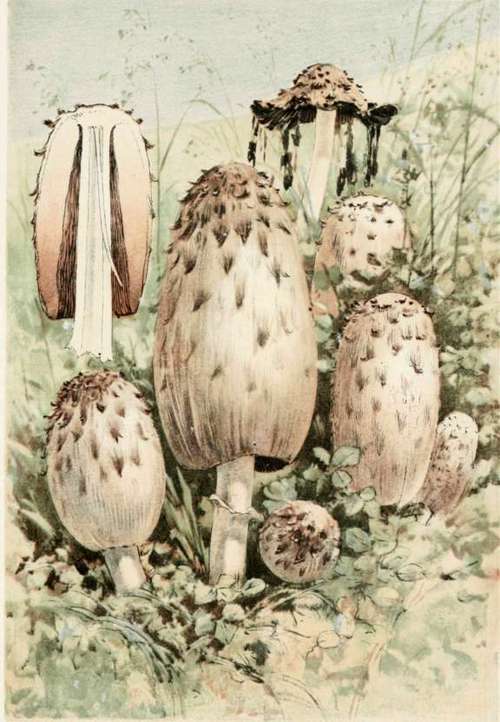 From Our Edible Toadstools and Mushrooms and How to Distinguish Them by W. Hamilton Gibson. A native to North American and European meadows and grasslands. It has been introduced to Australia and New Zealand. It is cultivated in China for food. The gills will change from white to pink to black and then secrete a black liquid that contains the spores… this black liquid is the reason for its other name “Shaggy Inky Cap”. This mushroom will “auto-digest” after it is harvested and quickly become unusable within 4-6 hours… this is why it is not seen for sale outside of rare farmer’s markets in the U.S. (however, it is raised commercially for food in China). 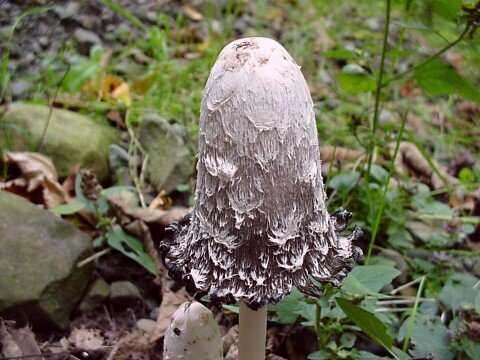 The Shaggy Mane is known to kill at least two species of nematodes, one of which is harmful to plants. Cooked – best steamed, or added to sauces or soups. Its high water content make it difficult for sauteing, but some insist this is the only way to prepare it. Battered and fried. 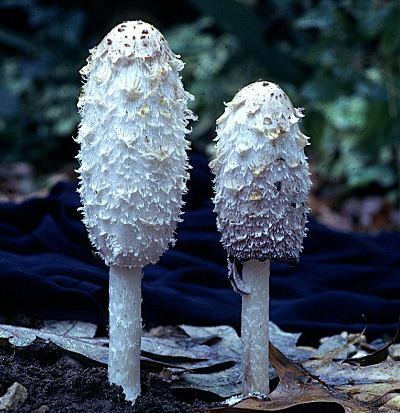 Shaggy Mane on left is perfect for harvest. Shaggy Mane in center is too mature for harvest as it is dripping “ink”. Shaggy Manes on right are almost gone. Harvesting: Usually just one flush in the Fall, but occasionally can flush in the Spring and/or Summer depending on your locale. Harvest daily, and be ready to use almost immediately for best results. Look for mushrooms that are firm, plump, clean, and with caps closed or just barely opened. Those that are already very open or just black rings on stalks should be avoided unless you are making a black-colored meal. Wild Harvest: NOTE: BE VERY SURE OF THE MUSHROOM YOU HARVEST FROM THE WILD! From Spring through Autumn in areas of recent disturbance after a rain. They are often seen along roadside ditches, gravel patches, or soil with lots of organic matter. Due to dirty run off from roads, mushrooms growing near frequently travelled roads are best avoided. Storage: Best used within 4-6 hours of harvest as this mushroom will quickly deteriorate. If the mushroom is cooked, it can store in the refrigerator for a few days. Another method to store fresh the Shaggy Mane is to place it immediately in a jar of water, then put this in the refrigerator. It is thought that the absence of oxygenated air slows the deterioration. Alternatively, after it is cooked, it can be frozen. Shaggy Manes being grown in a pile of composting leaves. Cultivation Substrate: Can grow on just about any rich, composted, organic matter. 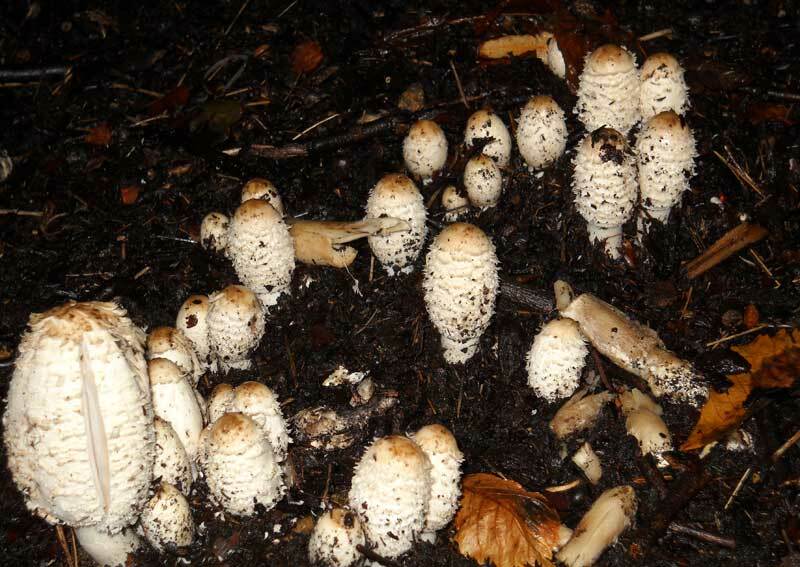 Cultivation Details: There are Shaggy Mane outdoor mushroom patch spawn available for purchase. Just mix the spawn into a soil bed or compost pile, water, and wait. 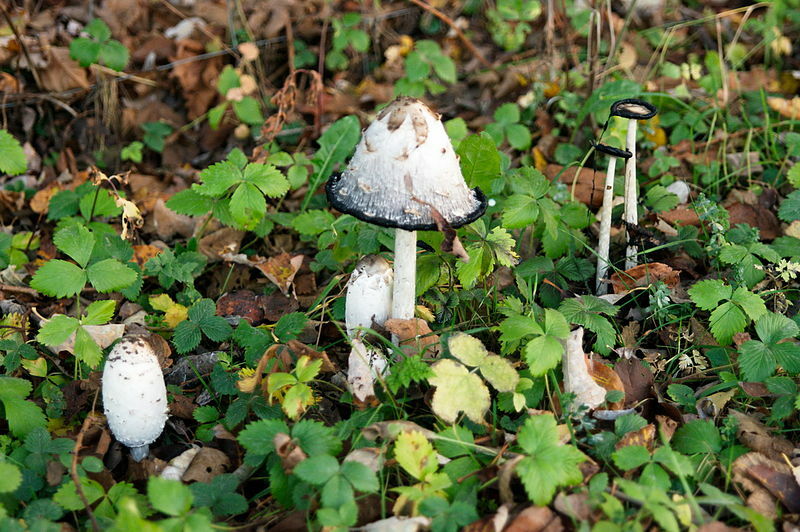 There are many, many “home remedies” to get Shaggy Manes to grow in new locations. When I try some and have success, I’ll write about it. Spawn Available: Many forms available from test tubes, to petri dishes, to bags… all ready to be mixed or buried in substrate. 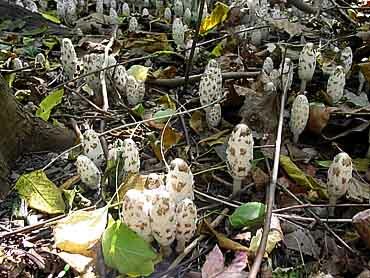 Incubation of Logs: If soil/compost with spawn is prepared in the Spring, they typically there will be Shaggy Manes ready to harvest in the following Autumn. A Shaggy Mane that is probably a little too mature to harvest for food. Fruiting Temperature: Typically needs cooler weather, but local varieties can have different tolerances from location to location. Induction of Fruiting: Typically needs sustained moisture for a few days before fruiting begins. Life Span: No reliable information that I can find. It seems that if you do not harvest all the mushrooms in one location, and the location maintains its high organic content, then there should be yearly, seasonal flushes almost indefinitely. Shaggy Manes can produce large flushes like this one seen above. Some people who eat any mushrooms from this family may have a bad reaction if they drink alcohol while eating this mushroom. It is kind of like nature’s anti-alcohol food. One person eating the dish can have a fairly significant, non-deadly reaction that lasts a few hours and then passes, while another person eating the same dish and drinking the same amount has no reaction… very interesting! If you have gout or kidney disease, you may want to avoid eating a lot of mushrooms since they contain concentrated levels of purines.